“Happy Place” is a mini hotel near Moskovskiy Railway Station. Our hostel easily seats 30 people. There are a lot of shopping malls, bars, buffets, cafes, Japanese restaurants, night clubs and of course architectural and historical monuments. Public transport system is richly developed – paying less you can get to anywhere you want. There are two subway stations near us, Ploshad Vosstaniya and Mayakovskaya, and a lot of buses also. 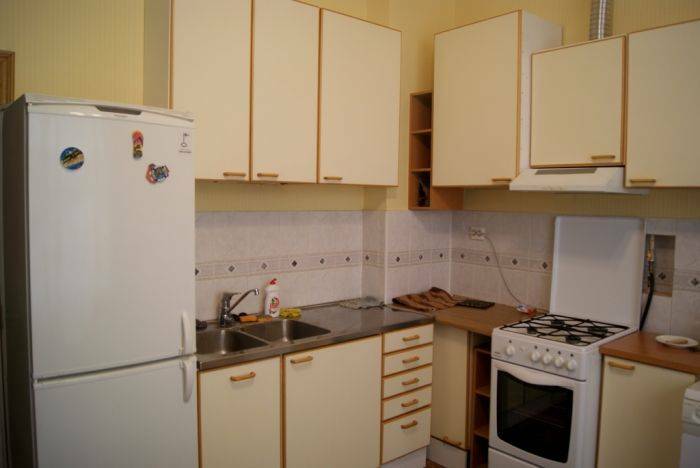 Our kitchen is well equipped with everything for cooking: gas stove, microwave oven, electric kettle, cooler and dish. We’ve also got tea and coffee for our guests. We have 2 restrooms, shower cabin and a bathroom in the hostel. You also can use fan, washing machine and an iron if it’s needed. We work 24/7. You can book in at any time. If you need some extra information concerning some excursions, exhibitions or other places to have fun ask our administrator. 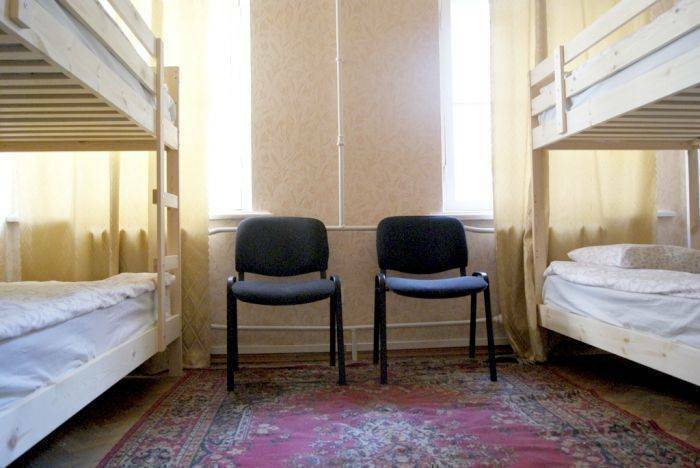 The hostel is located on Ploshad Vosstaniya which is in a stone's throw from major places of interest such as Isaac Cathedral, Pales square Kazansky Cathedral, Church of the Savior on Blood, Catherine Public Park, Yusupov Garden and many others. We’ve got 2 rooms for 6 people, one for 8 people and one for 10 people. Depending on your wishes we can divide rooms into “only for women” or “only for men”. 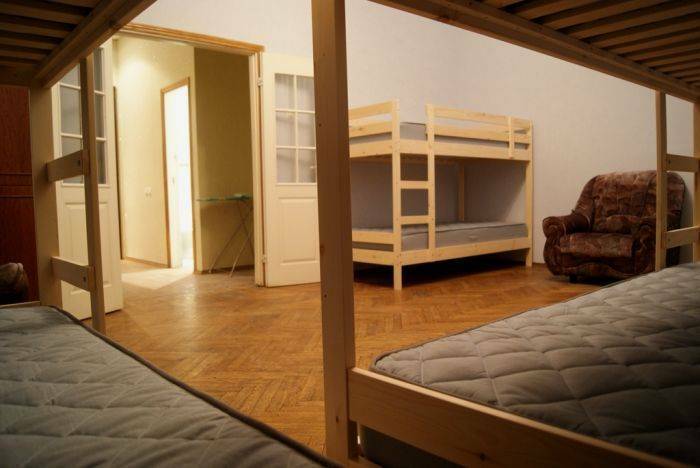 Each room contains bunk beds, lamps, socket, table and chairs. You should come out from the railway station, cross the street near the shopping mall “Gallery” and go straight ahead the Ligovskiy prospect (about 50 meters). Turn on the right and keep going to Pushkin’s monument, then turn on the left and go to second entrance with the number 18 above the door. Dial 24 on a entrance door intercom, we are on the forth floor, apartment №24. Take a minibus №39 to Moskovskaya subway station. Bus ticket costs 30 rubles. The bus stop is on the opposite side of the exit from Arrival zone. You should go to the station “Technologicheskiy institut II” , make a transfer to “Technologicheskiy institut I” and go out on “Ploshad Vosstaniya”. You should come out from the railway station, cross the street near the shopping mall “Gallery” and go straight ahead the Ligovskiy prospect (about 50 meters). Turn on the right and keep going to Pushkin’s monument, then turn on the left and go to second entrance with the number 18 above the door. Dial 24 on a entrance door intercom, we are on the forth floor, apartment №24. Take a minibus K3, 39A, K113 to Moskovskaya subway station. Bus ticket costs 30 rubles. The bus stop is on the opposite side of the exit from Arrival zone. You should go to the station “Technologicheskiy institut II” , make a transfer to “Technologicheskiy institut I” and go out on “Ploshad Vosstaniya”. You should come out from the railway station, cross the street near the shopping mall “Gallery” and go straight ahead the Ligovskiy prospect (about 50 meters). Turn on the right and keep going to Pushkin’s monument, then turn on the left and go to second entrance with the number 18 above the door. Dial 24 on a entrance door intercom, we are on the forth floor, apartment №24. There are two subway stations near us. Also you can take any bus to different ways.